Planning your network infrastructure for your new facility? Or simply need a few extra network drops? Contact us today for a free consultation. 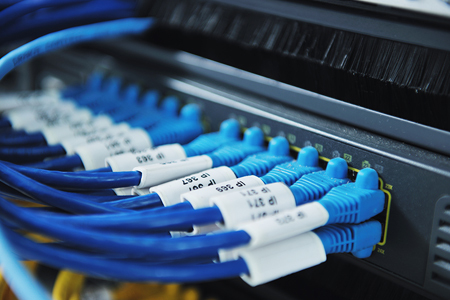 Network cabling is the backbone of your IT and communications systems. This is why it is important to hire the best cabling contractor in Los Angeles. What cable should you choose? What are the limitations of your data cabling infrastructure? We have the knowledge and years of experience required to deliver the best network wiring installations. From large data center design and installation, to a simple telephone line, we’ve got you covered. We offer structured data and network cabling via CAT5, CAT6, CAT6e, CAT6 Shielded, CAT7, CAT7e, and fiber optic cable. Our brilliant team will work with you to accommodate your current and future technology requirements through successful network cabling and wiring implementation. Tips for finding the best network cabling company in Los Angeles area. ask for references-check to see if your contractor has completed projects similar to yours and talk to those customers. Where they happy with the results? ask about the process-planning is crucial-make sure that whoever you hire will have the capability to plan for changes in construction schedule and other unforeseen circumstances. ask about change orders- how will they handle the change orders? This is where many contractors try to take advantage and overcharge you for small last minute changes. Make sure this is stated clearly in your contract. is your contractor licensed and insured? – this will cover both you and your contractor in case one party does not meet their obligations. combine services: working with many vendors can be a difficult task when planning an office move because some vendors tend to lack timely communication. Try to find a one stop technology company that can offer you network cabling installation but also related services like internet service, security camera systems, telephone systems, alarm systems, audio visual. This will make your life a lot easier. By the way, we do. Contact us for a free network cabling cost estimate. When it comes to network cabling contractors, you should always make sure that your contractor is experienced and has been around for many years – ask for references! Make sure your contractor is licensed and insured. Cat 6 network cabling has been a standard for many years now. It allows for 10Gbase-T connections of up to 55meters, assuming the cable is installed correctly. 10/100/1000 Base-T can be run up to 100 meters (328ft). Cat 6A (augmented) network cabling contractors will help you achieve speeds of 10Gbase-T at distances of up to 100 meters if high grade network cable is used. Installation technique is also very important in order to achieve 10Gbase-T speeds. Make sure that your network cabling contractor does a good job at avoiding kinks and sharp bends. Cable installers should not pull too hard on the Cat6A cable as this creates problems with your connectivity. The max frequency is 500Mhz for cat6a wires. Cat 7 network cabling provides for strict crosstalk specification and installation technique is also very important here. When using cat 7 network cabling you can reach 10GBase-T speeds at frequencies up to 600Mhz. Cat 8 network cables are designed for data center applications, where the distances between devices are short. The maximum distance for cat 8 cable is 30-36 meters therefore it should not be used for long office network cabling. Contact us today if you are looking for the best network cabling contractors in Los Angeles. We are a Los Angeles network cabling and data cabling company that provides our clients with high performance copper and optical fiber cabling solutions. We will manage a seamless network cabling installation. This will ensure connectivity, productivity and efficiency in your organization.